As I did last year, I am writing a post that reflects upon the lessons I learned in 2011. So, without further ado, here we go. Anytime I write something that might not be the most diplomatic, or I know will upset people, or portray a contrary view on a controversial subject, or even just has the potential for generating grief, I always tell myself the phrase, “blog fearlessly” and then hit the Publish button. It’s my moment where I resolve to be brave and put my words out there. That’s not always an easy thing to do in this online world of potential scrutiny and possible vilification, but I know deep down that being brave for this split moment will let me take the chance that my words will make a difference in an idea, a conversation, or a movement. We as a profession will never get to where we want to be in terms of innovating the information field by embracing a risk adverse mindset. 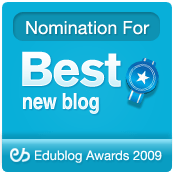 I look forward to taking more chances in 2012 with the topics and issues on this blog and taking on challenges at my library. I certainly hope you do as well; there is freedom in uncertainty, discovery, and the unknown. When your moment comes, be brave for that one moment. It seems silly, but there are times when I think that I didn’t do enough this year. Then, like the look from a bewildered friend, it hits me: The eBook User’s Bill of Rights. The HarperCollins petition at Change.org (70,000+ signatures). Presented for ACRL, ALA Virtual, NJLA annual, and did a workshop for PaLA. The MARC Madness Tournament thing. Oh, and that whole (still largely unresolved) NJ Q&A virtual reference debacle. Attended Computers in Libraries. 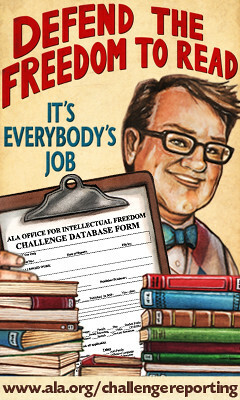 The campaign with the ALA Office of Intellectual Freedom. Plus whatever I was blogging (remember that “librarian unemployment is a boring topic” blog post? ), whatever I was tweeting, and whatever I was talking about in the ALA Think Tank group. There were some other things I found when I was just reviewing the year. I guess I was busier than I thought or remembered. But the other thing I came to realize? I got really, really tired. I wouldn’t say I was burnt out since that implies that I’m done; no, I’d say I was out of fuel. All of these things take their spiritual and mental toll, especially when there is a certain amount of spotlight hogging and cause hustling required to keep them moving and fresh in the online eye. In taking this to heart, I’ve learned to pace myself and be a bit more critical in assessing the projects that I take on. I’m looking forward to continuing to blog and my presentation at CIL2012, but otherwise I’m looking for projects that are less intensive on the public side and more for moving certain ideas within library circles. I’ll certainly have to see how this plays out, but I will keep in mind the notion of pacing myself. Over the course of the year, I’ve been fortunate enough to have people appear in my life at just the right moment. They have lent me much needed support when I was down, been an advisor and confidante when I need someone to talk to, and been a partner in crime for shenanigans, mischief, and other goings on. It’s been a year in transition for my personal life and I really wouldn’t have been able to do it and come out mostly alright without them. To these people, I thank you from the bottom of my heart. In examining the idea of timing, I’ve stopped seeing it in terms of being “good” or “bad”. The missed opportunity now could allow me to be available for something down the road while fortuitous chance may close a possible path. When I think of all of my choices over the years, it is a combination of these timings (both “good” and “bad”) that have yielded the person I am today. It’s a reminder that the complete bargain of this life is a culmination of these successes and failures. A simple lesson, but one that I often forget. I look forward to hearing the lessons that you took away from 2011. One of the chapters I was reading talks about the importance of perception and the difference between what we think and the reality of a situation. At the conclusion of reading this chapter, I started to think if what kind of gaps exist within the public library world. There is the ever popular statement “We are more than just books”, a silly little toss-away line that gets dragged out when a non-librarian associated the library with books. Yet, our most recent controversies revolve around books (mainly the e-version), book discussion groups continue to be a staple library program offering, and librarians themselves will brag and compare how many books they can grab up at a conference. I’d reckon that books (physical or digital) still dominate the material purchasing budget as well for the majority of public libraries which begs the question as to whether the statement should actually say, “We are more than just books, but not by much.” In our attempts to cast off the book stereotype, we have still tethered ourselves to them. I myself fall into the trap of dismissing Google by saying that it doesn’t have all the answers when there is so much that is not online or hidden by paywalls. But when someone asks me a reference question, that’s where my fingers first go for the initial search. It’s only when it is determined to not be on Google that I start looking at the other potential offline sources. On the basis of the my experience over the years, I’d say that any question is most likely to have some kind of answer on Google than not; it’s only when it gets to be a hyper-local or extremely niched topic that it comes up truly empty. It seems odd now to disparage a first tier tool simply because it doesn’t have all of the answers, something that is an impossibility of the highest order. I’m not sure if anyone will agree with me publically on this point, but I feel that there is a perception skew when it comes to professional awards and recognition. In recognizing outstanding efforts, activities, and activism, there feels like an additional underlying question as to whether the individual Deserves it or not. The capitalization in that last sentence is not an accident but to draw attention on the emphasis that some librarians place on the worthiness of award recipients. From talking with others and comparing notes, it’s the notions of “paid their dues”, “being the right sort of person to promote”, and “it’s their turn” all rolled up into one unstated criteria for professional praise*. The profession wants to showcase people doing good work, but woe to the awardee if they fail in any of these categories. I’d say it’s probably the main reason why we have so few librarians who actually break out to national recognition compared to other fields. Given all the talk about championing the library in the eyes of the public, the profession takes great lengths to prevent anyone from rising above the rest. This week I just caught Steven Bell’s latest column on the Library Journal website (with a bonus mention of Barbara Fister’s wonderful information literacy post; go on, read it) in which he urges academic librarians to read more business literature and take lessons from them. The gist of his column is that academic librarians can glean lessons from the business world that can be applied to the academic library workplace. It’s a simple and oft repeated approach: take the applicable stuff, try or modify it, and see it how it works out. There are crossover elements that can be used to improve the library. For myself, I can say I’ve only read one book written specifically for libraries (Bite-Sized Marketing, which was co-authored by the lovely, talented, and half of The M Word library marketing blog Nancy Dowd). Otherwise, I don’t seek out professional literature because the majority of professional books don’t really interest me while the remainder are books about subjects that I already know about. To be honest, I’m not much of a book reader; in an average year, the number of books I read could be counted on two hands. (It’s not that I don’t read at all, it’s that I read more online content.) But when I do read, it tends to be non-fiction and arguably related to my job. They tend to deal with how people think, perceive the world around them, and interact with their environment in terms for laymen. That’s just what I happen to like. As Steven is urging academic librarians to read business literature, I’m urging librarians of all stripes to read more non-professional non-fiction literature. I’ll give a few of my favorites from over the years. 1.) How We Decide by Jonah Lehrer. It’s not so much about making decisions but how decisions are approached. What we commonly think about as easy decisions are the culmination of everything we have learned and experienced up to that point. How the brain evaluates information in making choices is something critical to the information literacy we hold so near and dear. Jonah provides an excellent overview of what goes in our minds when to approach decision points. 2) Blink by Malcolm Gladwell. Where Jonah puts decision making mostly in the context of brain function and neuroscience, Malcolm examines it from the experience and information filtering. It is this second point that is crucial; that individuals be able to determine what really matters in a situation and make a decision on that basis. Like Jonah, he talks about how the brain can express things before the conscious mind can articulate them. It’s fascinating to see how much processing happens “behind the scenes” even before actions reach our lips and bodies. 3) Buyology by Martin Lindstrom. As someone who creates library publicity, this neuroscience approach to how people see advertisements and their brain activity is (no pun intended) mind-blowing. It has influenced how I approach creating flyers and other advertisements within the library. In an stimulus saturated world, what makes it through our filters into our brains is now vital to making a connection between people, objects, and places. It instilled in me the power of association and in turn shaped how my flyers look in order to generate (hopefully) greater interest. 4) Rock, Paper, Scissors: Game Theory in Everyday Life by Len Fisher. I read this a few years ago so my memory is a bit sketchy. But a little logic in the guise of game theory wouldn’t hurt anyone. Furthermore, it discusses interactions in which people independently or as a group evaluate situations in order to get the best outcome. (Which, to me, could explain some of the problems of library eBook lending. How does one arrive at the best outcome when the other parties involve don’t trust each other?) It also addresses fairness and equity (something I’m sure my peers would agree are desirable librarian traits) from the game theory perspective. 5.) Kitchen Confidential by Anthony Bourdain. While some might not appreciate the hilarious vulgarity that is Anthony’s style, at least read the chapter entitled “How to Cook Like the Pros”. Among the practical cooking tips are the more philosophical ones that I have taken a liking to. Use good ingredients, use few ingredients; in one motion it signifies to me that the best results come from the quality of the effort that goes into it as well as its simplicity. Library publicity might not be a culinary delight, but I have taken these ideas to make my press releases and flyers both colorful and concise (each in their own manner). It’s a good metaphor for all the work that goes on in the back of the library that makes everything in the front look so damn good. Those five should get you started. If you have other non-librarian professional books you’d recommend, be sure to share them below! Note: I’ve decided from now on to use links to LibraryThing rather than Amazon or WorldCat. In doing so, I’d like to urge my fellow bloggers to link to sites like LibraryThing rather than those sites when mentioning books. When I came home Sunday, there was a package waiting for me at my doorstep. Delighted and pleasantly surprised upon reading the name of the sender (a good friend who will not be named but is appreciated greatly), I dropped my bags inside and set about to open the USPS box to see what goodies awaited me. Slicing off the tape with scissors, I reached through some brown packing paper and pulled out a large Ziploc bags holding two smaller holiday bags. I squinted and peered through the narrow transparent portions of the bag, trying to figure out their contents. Cookies, I surmised, turning them over till I could see. Ah, yes, I could see the wonderful doughy edges and corners now. Excellent. It was at this point that my nose began to tickle. A particular strong odor was now present in the room. While not unpleasant nor disgusting, it was immensely potent and not one I recognized. I opened the ziploc bag in my hand and stuck my nose in to take a whiff. No, that’s not it, I thought as I set aside the bag and reached into the box once more. Rummaging through the paper, I felt another smaller sandwich bag at the bottom of the box. It was heavier than the larger bag and much more solid to my touch. As it cleared the edge of the box, it became very apparent that it was the odor source. It too held a holiday bag, although this one had split during the course of its journey. My scientist brain kicked in. White. Looks like granular sugar. Smell powerful but don’t know what it is. No label on the bag. There I stood for a few minutes, turning this bag over and over while my brain tried to match it to anything it could in vain. Sugar? No. Crushed peppermint? Doesn’t smell like it. Salt? Why would she send a bag of salt? To keep the cookies fresh? Really? Hey, man, I just work here. You oughta kick this one up to Analysis. Rather than spend any more time wondering, I texted my friend. Me: Oh, thanks for the package! Merry Christmas! Saaaaaaay, I see two of the bags are cookies. What’s in the third bag? The next day, I get a reply that only deepened the mystery. I look at the phone, quietly contemplating this new development. Was there a mistake? Did she send me dishwasher powder or some other cleaning agent by accident? (That’s another theory I came up with over time.) How many packages did she mail so that she would not be able to recall what she had put in mine? Undeterred, I texted her back. Me: You sent it to me! Friend: Lol it’s a surprise! Just eat it! After I got home that day, I grabbed the bag off my dining room table and examined it again. Still white, still granular looking, still very strong in odor. I’d say it wasn’t like anything I’ve ever smelled before, but as a man, my smell categories are limited to “masculine”, “not masculine”, and “other”. As it was not the clearly not the first and not immediately identifying itself as the second or third, it presented a quandary. But, having been assured that it was “a surprise” and that I should “just eat it”, I opened the sandwich bag. While I thought the smell on the outside of the bag was very strong, cracking open the bag pushed the line upwards to “universe enveloping”. It would be akin to going from the scent of second hand smoke linger beneath your nose to taking the lit cigarette and plunging it upwards into your nasal cavities. The word “omnipresent” has yet to find a better non-divine example. Needless to say, this created many doubts as to my friend’s assurances. My quickly established inner compromise was to take a singular grain onto the tip of my finger. I sniffed it once more as if that particular dot on my finger was the problem and not the hundreds of thousands if not millions of its brethren still sitting in the bag inches away. Nothing new was gained from this and so, in one swoop, I dabbed it on the middle of my tongue. It was neither sweet nor sour nor bitter nor salty. It was vile. I made an all vowel noise that universally signifies across the multitude of human cultures that what I had tasted was a very big mistake. In making a a b-line to the sink, I spit out what was left of the grain, all remaining saliva (contaminated or otherwise), and anything not firmly attached to gums or jawbone. Now I was stuck with an immediate mental aftermath full of questions. What the hell did I just try to eat? When was the last time I pissed her off? Was she trying to poison me? (Historically, women are poisoners so this was a remote yet plausible possibility.) Or was this a recipe that had gone horribly, HORRIBLY wrong? I settled on the last one as the most likely explanation as I dumped the bag into the trash. I could still smell it, so I pushed the bag way down in the trash bag in the hopes that the decaying kitchen garbage above it would mask the smell till I took the bag out. I took the time honored vow to thank her once more and then never mention it again. Six hours after our text conversation, I get another message from her. Friend: I just realized what you were asking me about. The bag? It’s bath salts. That all vowel noise that I made when I tasted what I now discovered was bath salts? Yes, I made it again. We then had a lovely text conversation about what it was like to taste bath salts (“horrific”) and how incredibly sorry she was for not labeling the bags. I discovered that the odor I did not recognize was in fact lavender (to which it was properly placed in the “not masculine” category). I rescued the bath salts from the trash, put it into a new sandwich bag, and am looking forward to using the bath salts in the proper manner in the near future. Label your all Christmas goodie bags since you never know how might try to eat them. I will try to eat anything. Happy Hanukkah and Merry Christmas, folks! Here’s some basic visualizations from Google Documents. 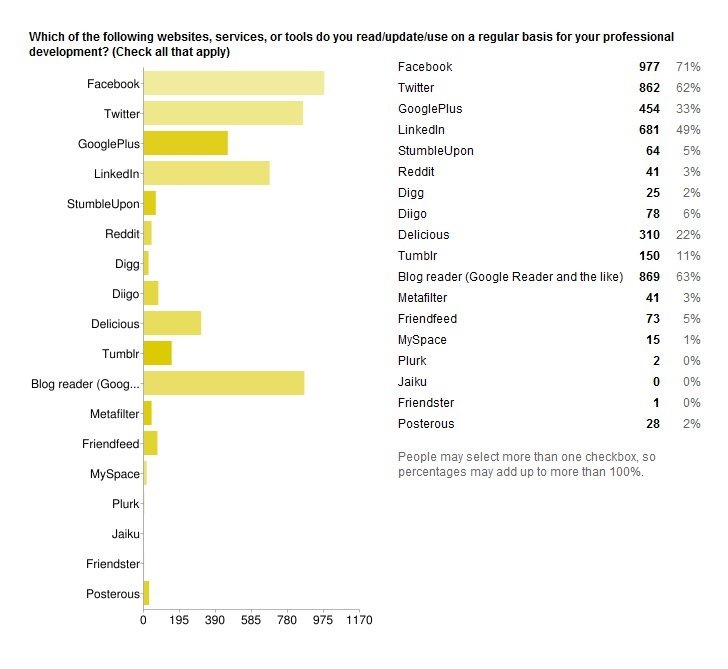 Here are the results of 1,383 replies. If you do happen to use the data, please let me know so I can see what your analysis yields. It’s been a long time coming, but I have to fess up and admit it: I am suffering from filter failure. In my dive into social media, I forgot one very important limitation: myself. As much as I wanted to FRIEND/FOLLOW/CIRCLE/RSS ALL THE PEOPLE, I crossed a line where the tool moved from being useful to information cacophony. With the ease of adding people and feeds, it’s not one of those situations where is becomes obvious that you have gone too far. No, it’s been building up for awhile and only in the last few weeks have I realized what I had done. While unsubscribing to email lists and blogs is relatively painless and easy, there is a certain apprehension that fills me when it comes to the people on Twitter and Facebook. It’s the unfortunate paradox of not giving too much thought to following or accepting a friend request, yet really not wanting to hurt someone’s feelings by removing them from either. “Sure, I’ll be your friend, random internet quasi stranger!” is how it starts, but the negative connotations of exclusion and unfriending make it feel like the most public kind of snub. Perhaps it is the term ‘unfriending’ that makes it seem so dire and such a commentary on the relationship. There is no easy way of saying “I no longer want to be your friend, even though if I took time to examine the depth of our relationship I could only describe you as a remote acquaintance at best” because people will stop reading right at the comma. The rest of the sentence as well as the context and meaning is lost after the comma.